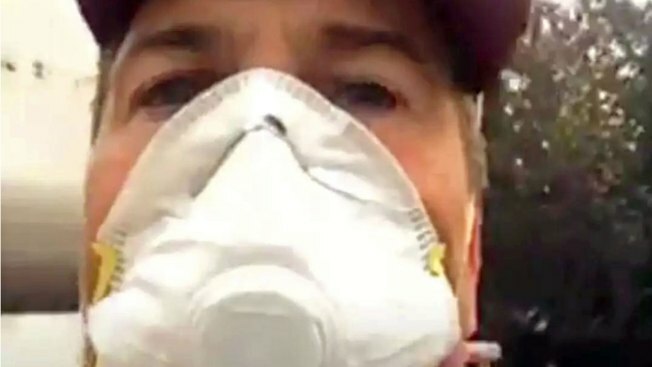 This Sunday, Dec. 10, 2017, image made from a video on Rob Lowe's Instagram account shows the actor in a mask as he live-streams his family evacuating from their smoke-shrouded home, where a growing Southern California wildfire is threatening homes in the wealthy enclave of Montecito. "Praying for the people in my area," Lowe said to his Instagram followers. "Hope everybody's getting out safe like we are, and thanks for the prayers and thoughts. And good luck to the firefighters, we need you!" Actor Rob Lowe offered firefighters battling the destructive Thomas Fire in Southern California a home-cooked meal, posting on Instagram this week a photo of the gathering of his "new friends." The blaze has been blamed for two deaths, destroyed at least 750 homes and charred at least 272,000 acres to become the second largest wildfire in modern state history. Lowe has been chronicling the fire’s path on his Instagram account beginning Dec. 5 when he posted a video of a hillside in Ventura County covered in flames. Weeks later, the blaze is 60 percent contained, but still burning. Lowe, who has been praying for Santa Barbara, looked on as the fire got closer and closer. Thanks to the tireless efforts of the firefighters, his home is still standing. "Thank you to all the crews from all over the country who stood tall and saved my town. #respect #gratitude," the actor wrote on Instagram. In a gesture that’s simple, yet powerful, “The Outsiders” actor provided the firefighters a home-cooked meal inside. My commute home tonight. We are safe. Others aren’t. Pray for them. “Dinner for new friends at our house,” he wrote.